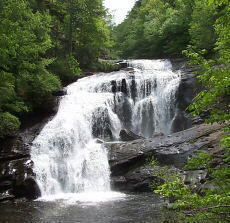 There are many things to do in the Cherokee National Forest. You can spend days sightseeing, visiting Bald River Falls, The Cherohala Skyway, Buck Bald, Tellico River, Starr Mountain, Indian Boundary Lake and many more beautiful sites. If fishing is your passion, there are numerous streams and rivers nearby, like the Tellico River, Hiwassee River, and great trout streams like Citico Creek, North River and Bald River and Brookshire Creek. 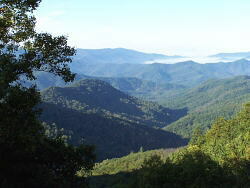 Hunting is good along the Tennessee / North Carolina state line and surrounding areas when in season. 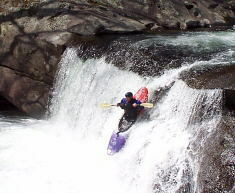 Kayaking, canoeing and tubing can be found nearby on Tellico River, Hiwassee River and Ocoee River. 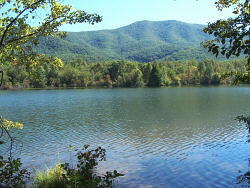 Many hiking trails are available in the forest for Hiking, mountain biking and horseback riding. The nicest trails are along the Cherohala Skyway and in the Slickrock-Citico Creek Wilderness Area and on Starr Mountain, and in the Bald River Gorge Wilderness Area. There are several good places within 2 miles of Mountain View Cabins to eat, if you don't like to cook. 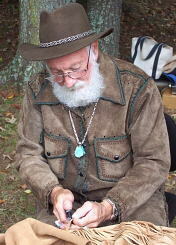 There are many local events taking place during the year as well, such as The 4th. 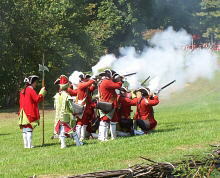 of July Street Dance, Car Shows, The Autumn Gold Festival and monthly events at Historic Fort Loudoun. There are many flea markets and yard sales going on all year long too. So what are you waiting for come on down and explore the area, and spend some time in one of our great cabins. Indian Boundary Lake in Early Fall. banks & with non-motorized boats.